I'd rather C2E than work! 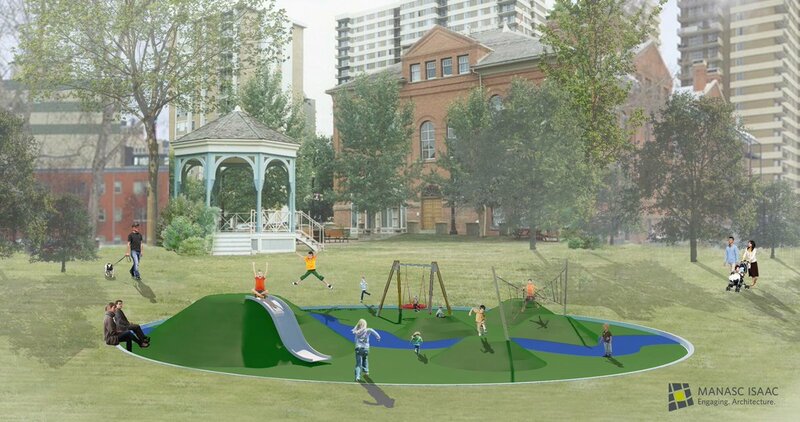 On CBC radio this AM Mayor Iveson hinted about a spray park and possibly putting in a small playground in/around Churchill Square. These are massively stupid ideas. Apparently "child-friendly" in Edmonton terms means pandering. Spray parks are the worst. Literally the tackiest things known to man. I don't care if they're for children. Downtown churchill square is for everyone to look at and frequent, not just kids. What existed before was a perfect compromise. You don’t see beauty the way I do. Kids love spray parks. Seeing a whole bunch of kids yelling and screaming and running and having a great time is always a better than any communication among adults, especially the ever hyper-critical conversations. Spray parks have their place. It's not by city hall. We want gaudy animal plastic thingies in literally the centre of the city and its seat of government? Oh man. You’re just building an ever stronger case for a spray park. Yes, so it can be child friendly..
Plug C2E into my veins!!! Spray parks are great however I don't think one would be appropriate for Churchill Square. What is appropriate is what already exists, a wading pool! A beer tent would be lovely. Now I want go back to Europe again. Oh no, no, no. A pedestrian product like beer being served near the seat of government. Tsk, tsk. We could get Arcadia to run it so it would only be Alberta craft beers! "For every complex problem there is an answer that is clear, simple, and wrong"
The Stanley Milner missed a huge opportunity to add an indoor playground. City Center Mall missed that boat too, when they renovated the food court. With the wading pool at City Hall as is, a spray park at Centennial Plaza would be redundant. Downtown needs an indoor playground of some size in a public/semi-public space. Downtown needs a play place period. not sure why it needs to be indoors though. Millions of dollars have been spent on a dog park, but zero for anything that makes downtown a place for children to live or play. Maybe the old coliseum would make the world’s greatest kids’ play place???? I’ve slresdy suggested a Children’s Museum for it and earlier for the old Rossdale Power plant building. We need an indoor playground for the winter months. How about getting an outdoor playground for downtown first for the summer months before a more expensive indoor playground, especially when we consider the demographics of the area. If somewhere needs an indoor playground, it's not downtown. Indoor playgrounds are already in operation by private businesses all around the city. If they feel that the downtown market could support one, they'll certainly have a go at it. Millenium place and Black gold have indoor playspaces in their rec centres, but I believe you have to pay to access. I don't know if any of the Edmonton rec centres have them. The downtown YMCA has (had?) a small one. Most rec centres have something good enough for toddlers, some are good enough for all preschoolers. Nothing really for school age kids, but they can play outside, mostly. and they really need something bigger than will really work as a free amenity. Maybe just a McDonalds Playplace is what is really needed. $1 coffee and you're in. There can only be one. An indoor playground in a PUBLIC/semi-PUBLIC location would be a great amplifier of things already happening in the Churchill Square nimbus. Go for a skate at city hall, maybe a program at Stanley Milner and an afternoon mucking around in an indoor playground. An outdoor playground in that area would be a redundancy. Calgary has a great indoor playground in a downtown mall food court. I take back what I said about hand wringing over the city hall wading pool controversy. Plenty of pushback about this utterly stupid decision. The Journal had a good editorial on the subject today, couple letters to the editor etc. ^A foodcourt playground would work well. The west basement location in City Centre would have had room for one, I don't know about the new one. When that downtown Y first opened you just knew they weren't serious about offering indoor activities for kids unless it was a program/cost recovery model which is fine but cut the happy talk. And the Art Gallery "kids space" is a joke - complete afterthought. I checked out one of those by the hour daycare joints (again, in Calgary) - it worked well but you really pay for it. They often operate off hours too, evenings, nights. Don't think there is one in Edmonton in fact. What are rates like for by-the-hour daycare? There are a lot of people angry about taking the wading pool out, but why are they taking out the trees? does anyone know? What did the trees do? They will be replacing them in soil cells with types that are more 'appropriate' and further back from the chlorinated water. But they have been fine there, we never saw anything wrong with them. Neither did I, but that's that I am told. pick some of the largest and healthiest trees in all of downtown and spent tens or even hundreds of thousands of dollars to replace them with something smaller and further from the water that won’t provide shade to those kids in the pool - after all they’re only kids, let them fry in the sun. oh wait, let’s get rid of the pool itself - then we won’t have to worry about any kids! in the meantime we can continue to put up with stunted trees and empty tree grates just about everywhere else downtown instead of adding soil cells and irrigation where it would have a real effect on increasing our tree canopy. besides, didn’t anyone tell them chlorine dissipates from aerated water (like the water that drifts from the fountain jets) even faster than from standing water and in both cases it’s accelerated by sunlight? this isn’t logic - this is simple rationalization and it seems like it’s being used to support a whole series of seemingly poor decisions. Last edited by kcantor; 18-12-2017 at 09:36 AM. I think they should just postpone all this City Hall work for now. Why fix what isn't broken? I thought the only trees they were removing were the ones right next to the pool. If so they're the smallest trees on that site. Half the size of most of the trees in Churchill Square. The paving stones are 'broken' it seems as the sub base is failing. The pool needs work due to 'new regulations' and other civic precinct work. no, even if the sub-base is failing, it doesn't mean that the paving stones are "broken". if the sub-base is failing, then any paving stone or granite slab or concrete surface or asphalt paving will fail as well. it's 25 years old so that sub-base has actually performed pretty well in edmonton's climate and geotechnical characteristics. so fix it, just as we do our streets and sidewalks. but the need to do repairs after a quarter of a century is no reason to change the paver design to something that is uniquely edmontonian to something that is uniquely generic. the architect that selected that design as an integral part of the city hall experience is still around. my guess is he was consulted as much on this changeover as he was on the proposed changes to the pool. the pavers that are there pick up the colour of the tyndalstone in some of the arcs and also mirror the stone's unique inclusion of fossils as well as complementing the makeup of the interior floors in similar fashion. it's also cooler to walk on in the summer, less slippery to walk on in the winter and less of a heat sink. granite - as much as i love granite - would do none of these things. it would simply be another case of someone assuming they can do something better than what was done originally. maybe some of us should just get together and see if a historic designation could be secured somehow for city hall despite it being "only" 25 years old because none of these things would comply with the standards and guidelines for the conservation of historic places in canada. The reason why I say delay it is because they are going to tender for the work soon. Shut it down, sent it back to the drawing board. A lot of this is clearly driven by bureaucratic wankery. Calgary, Drumheller and Red Deer keep wading pools. Why can't Edmonton? $150,000? That's like $1500 per playground aged kid in the neighbourhood. Giving less of a damn than ever… Can't laugh at the ignorant if you ignore them! It's a good thing that a new playground should last 40+ years, then. Great for the kids. I hope they enjoy every moment they are playing in it. Plus picnics. Gone............................and very quickly forgotten may I add. $150,000 doesn't go very far. Acting Sgt. Nicole Davie says she joined the Edmonton Police Service to create positive change in her community – and what better way to do that than to help establish Edmonton’s first downtown playground? 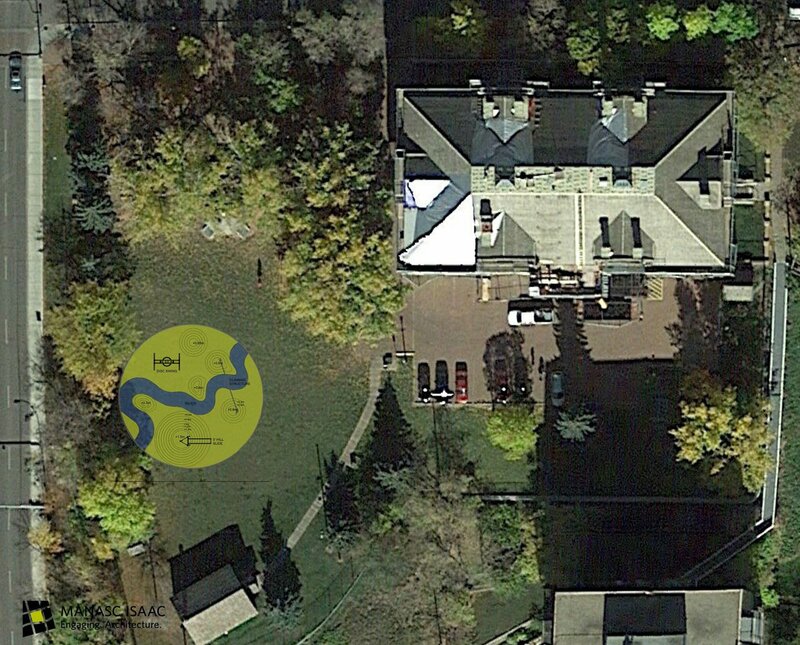 Davie has spearheaded a campaign to build the first playground in downtown Edmonton, on the site of the historic McKay Avenue School, next to the Edmonton Public Schools Archives and Museum at 10425 99 Avenue. Davie would frequently patrol the downtown area as a community liaison officer and noticed there were several parks in the area, but no actual playgrounds. “I just noticed there was a lack of spaces for children and families to be in (downtown),” Davie said. “I saw a lot of children, because I believe there’s 11 daycare facilities in the downtown core, but not a single playground. Eleven day cares in the downtown core and no playground. This new playground will be a great reason to take the kids for a walk on a nice summer day to go play there. Each daycare requires their own as per the regulations, but this will allow additional play and 'field trips' for the adorables. This is true but some of the day care play areas are not grass or very big. This one will be actually grass and larger. Win win for the kids. I worked with Kerrilyn at https://www.yeghousesearch.ca and she was great for helping us identify family-friendly neighbourhoods that checked off all the boxes. I think even the downtown has become more child friendly as other posters have suggested but we did a lot of research and some areas are definitely better than others. Interesting article on families living in small, urban spaces. Key is options, and building infrastructure to allow that diversity (downtown, inbetween, or suburb) while building a healthy city. The big thing is addressing the missing links and nodes and getting ahead of the curve in urban living and design. Doesn't mean we need to replicate the family in the article to a tee, but to address some key "high density housing for families with children" design guidelines, proper amenity spaces, inclusion of larger units more functional interactive passive spaces around the building or what hob nobs tout as the social interactive space of higher density living. All key. But more playgrounds with key surrounding proper design and frontages. Live and love... your neighbourhood. I am so very pleased to announce that we have raised the funds, thanks to so many incredibly kind folks, to move this forward. Expect a summer opening!!! On the whole I'm pleased to see something like this happen in that space. But you don't need the climbing structure. One of the best existing things about that park (and surrounding area) are all the low to medium walls around. Some are plenty wide for even the youngest of kids to tackle. And of course you've got the bandstand - great for climbing. Sliding is good, swinging is good. The slide looks a little rinky dink. It should be bigger. A bigger slide is a climbing structure of it's own. Great spot for a pop-up greenshack. Keep in mind that this is to be for younger kids and semi-contextual to the age of the schoolhouse/building. Any school age kid can climb on the things I described. If you're building a park for toddlers than it's just a waste of money. If things "semi-contextual" are in play than lets consider the "context" of the space as it currently exists. Can't wait to see this built. Great to hear that the French Immersion enrolment requirement was met for Oliver School Kindergarten!!! ^That's great news! I knew parents have been trying for at least 5 years. Expect an announcement on June 13th about another Child Friendly Edmonton initiative. The Child Friendly Business Recognition Program was created to celebrate businesses that are intentionally welcoming to children and their families through 3 major factors: Attitude, Amenities, and Activities. Over the past several weeks, over 30 businesses that have been identified as already being child friendly have been invited to pilot the program to ensure that the program is meeting the needs of both the businesses and their customers. A launch event will be held on Wednesday, June 13 from 12 - 1pm to invite all businesses throughout Edmonton to participate in the program and become child friendly. Working towards a more child-friendly Edmonton. Oh, the irony of it all - as a member of the council preparing to desecrate the most successful child friendly "initiative" in the downtown. Starting location: City Hall – #1 Sir Winston Churchill Square Meet on the south side of City Hall beside the fountain. ^ I find that really ironic. I live across the way from a park with a play area and it's nearly always deserted outside of school hours. The kids play there mostly because they're captives I think. When I saw kids at the City Hall wading pool, on the other hand, all I saw was joy and fun. Instead of putting a wet blanket on the pool they should be amplifying what it brings. At the end of last summer the city held a poorly attended, poorly advertised "beach party" with The Tsunami Brothers playing, lots of games in the pool, dryland fun. It was the right idea for sure. How about trucking in some sand to the adjacent road for beach volleyball? 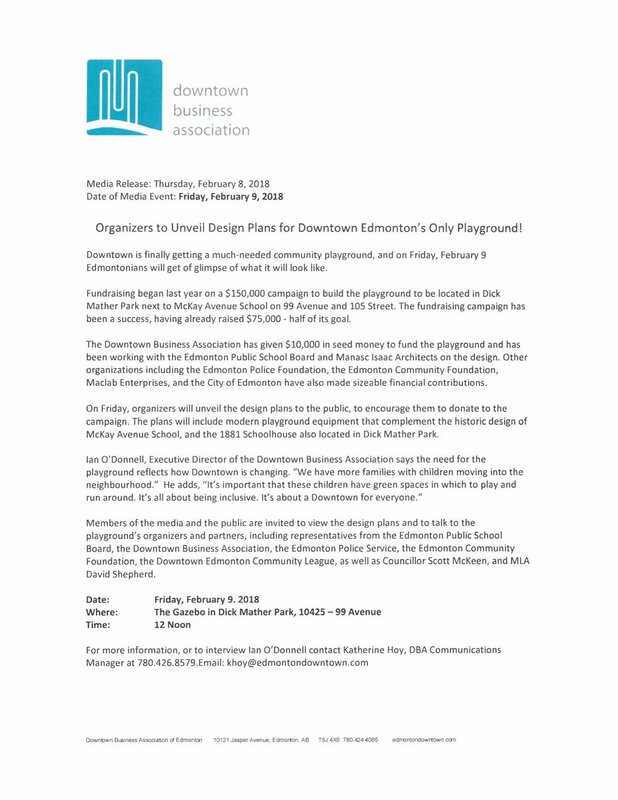 Media and the public are invited to attend the launch event for Child Friendly Edmonton’s Business Recognition program. The program promotes and encourages businesses to be more intentionally welcoming to children and their families. City Councillors Bev Esslinger and Aaron Paquette will bring greetings on behalf of the City along with Ian O’Donnell, Executive Director of the Downtown Business Association. Edmonton businesses can now sign up through Child Friendly Edmonton to be recognized as a welcoming space for children and their families. The Child Friendly Business Recognition Program encourages businesses to be intentionally welcoming to children, families and caregivers through the program’s “Triple A” categories: attitude, amenities and activities. There are a number of simple improvements businesses can make to become more child-friendly, including providing appropriate seating for children, activity/colouring sheets and washrooms that can be used by all genders. Councillors Bev Esslinger and Aaron Paquette were on hand to help launch the program, which is now accepting applications for the growing list of over 30 child-friendly businesses in Edmonton. The Downtown Business Association shared its support of the program, encouraging members to explore ways to be more welcoming to families, such as posting hours where children are welcome. Parents can also nominate and share feedback on businesses through social media using the hashtag #ChildFriendlyYEG. My kids are 15 now but I don't remember ever having any real issues with businesses when they were younger. If I had to bring anything up now it would be City Hall wading pool débâcle and lowering residential speed limits. Careful Turnbull. Bringing up issues with actual impact on children/families and their safety will not be tolerated. More crayons and stroller parking! Kids love fancy sidewalks and overdone light standards! They do like smooth sidewalks and the light standards are for the grown-ups as we're the ones who have to pay an extra levy on our taxes to get them.. at least in the neighbourhoods. All the pre-schoolers are waiting with bated breath for the latest Jasper Avenue makeover! A picket fence and a backyard are still the gold standard, even for millennials. Canada's young families are giving up on the dream of owning a single-family home, but it's not out of a desire to live an urban high-rise life — the cost has simply become too prohibitive. That's the key takeaway from a new study carried out by Sotheby's International Realty Canada, which found that, if money were no object, 83 per cent of young families would buy a detached home as opposed to any other type of housing. Only 5 per cent prefer condos. Last edited by 240GLT; 01-11-2018 at 12:09 PM. Other similar studies have noted that responses change somewhat when the questions ask about trade-offs including commutes and neighbourhood amenities. I'm not really a fan of apartment living but I've never been more jealous of a home than friends' townhouse just a couple blocks from Queen & Spadina. I was particularly struck by #4 on the list - the kids library has a jungle gym/indoor playground because, you know, winter is long and indoor play spaces downtown are VERY important. Stanley Milner with a big miss in this regard. Is this surprising to anyone? Even a devout urbanite like myself understands the appeal for single-family housing, that said, we have a lot of other options and more coming. The key is to ensure that we have the infrastructure in our most urban communities including daycares, schools, parks, playgrounds, indoor spaces, services along with more housing options such as townhouses, semis, duplex etc. Whose gonna be first among the bucket brigade?